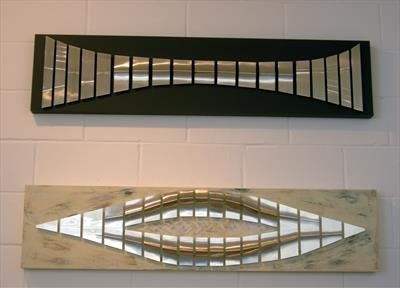 Two sister pieces which can be shown as displayed or each stand alone - wall sculptures. REFLECT - Dark background - calm, peaceful, meditative, reminiscent of landscape/lake and reflected scene. ION - Ionosphere - light and airy - a region of the upper atmosphere which affects radio waves and others - image references a 'hole' in the upper reaches of the atmosphere and ionization in turmoil.